Fixed a custom chat issue that could cause the game to crash when using alt + tab. Fixed a medals related bug some users were experiencing that would cause the game’s process to remain open after exiting. Fixed a custom chat rendering issue on Vista. Fixed a small typo that causes the Halo Reach medals script to fail when awarded the ‘Unfriggenbelievable’ medal. Download the updated script here. Just a minor update to redirect all 1.09 clients (update to 1.10 already) to the new master server now that Gamespy has pulled the plug. Fixed an OpenSauce compatibility issue that crashed the game on launch. Fixed a bug with 1.10 where the draw distance wasn’t automatically being increased for certain custom maps. For those using WINE, if you could post your distro and whether you’re using HPC or HCE in the comments, that’d be helpful. Windows XP users will now be able to see the custom chat, although it’ll use an installedÂ typeface rather than the featured one. Â This bug is caused by Windows XP itself and there isn’t a suitable workaround (apart from getting a newer OS), although you’ll be able to select your own typefaceÂ at some point in the future. Some maps could cause the game to crash after downloading. This was a regression (plain English: it worked, then I broke it) introduced in the January update. Forgetting to use an option (0/1/true/false) with custom_chat will no longer cause a crash. opticÂ – display all available medal packs. optic load <pack name> – load a medal pack. For example, optic load halo4. optic unload - stop the medal system. You do not need to use unloadÂ to simply load another pack. The optic load command only needs to be used once. HAC will remember your preference for the next time you start the game. Although you’re welcome to open the provided medal packs to see how I’ve done things, documentation will be forthcoming (next week, ideally). If you encounter any problems with using Optic, please see the troubleshooting page. HAC and OpenSauce are once again compatible. Fixed an error that could prevent custom_chat 1 from working (“Unable to load font!”). Fixed a HUD issue where the game type icon wasn’t being scaled correctly on extremely wide resolutions. Added a new command, font_size, that can be used to control the custom chat size. Example: font_size 30. HAC no longer loads on WINE. I’m still looking into this. Corrupt chat text on low-end graphics hardware. May not be able to solve this without access to a machine experiencing the problem. Fixed a bug in HAC’s crash handler that was causing some crashes to be falsely attributed to HAC. Added more detailed error feedback for the custom_chat 1 command. Fixed a bug that could potentially cause a crash when launching/maximising the game. OpenSauce and HAC 2 are currently incompatible. A solution is being worked on, so hold tight. Optic may have compatibility issues on some systems. A solution is being worked on. Halo Chat V2 won’t work if custom_chat 1 is being used (and vice versa). This isn’t considered to be a bug, so there are no plans to fix this. Just a minor update to fix a few issues introduced by the rushed 2.1.2 that was primarily intended as a 1.10 compatibility patch. Joining 1.10 servers on Halo PC (CE unaffected) will now work as expected. Map downloading is once again functional. “Play ball” is no longer announced in the place of “double kill”, as amusing as it was. As a peace offering, a console command that can be used to enable a test version of the new chat system has been added. If you’d like to give it a try, use ‘custom_chat 1‘. An example of what to expect below. Note: If you’re having problems since updating to 1.10, please remove all other mods to ensure that the problem is actually related to HAC 2. The sightjacker will no longer advance by two players at a time when using the keyboard controls. HUD colour resets now save correctly. Field of view preferences had a small chance to reset if the game didn’t exit correctly. The sightjacker will now automatically continue to track your target after respawning. The BSP upgrade is now available for all game versions rather than just CE 1.09. The HUD colour shortcut key has been moved from F9 to F8. The particle limit has been increased by 50%. Active camouflage now renders correctly on Nvidia cards (not tied to 1.10). Scope blur can be disabled via a console command without requiring the disablealpharendertargets config.txt mod. Resolution selection is no longer limited to a maximum of 1600×1200 (not tied to 1.10). Your resolution in windowed mode can now match your desktop resolution. The game now has a windowed-fullscreen mode. The full active camouflage effect will now display correctly on Nvidia cards by default. If you wish to revert to the old effect, you can use the console command camo_fix 0. Scope blur can now be toggled with the command scope_blur 0/1. This removes the need to add the potential undesirable disablealpharendertargets option to your config.txt. 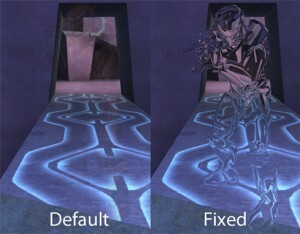 The requirement to specify the -vidmode argument has been removed with a fix to Halo’s video options to allow for the selection of all supported resolutions. Additionally, when running the game in windowed mode (-window), users can toggle between windowed and the new windowed-fullscreen mode by pressing alt + enter. As with other games that offer a windowed-fullscreen option, your game resolution must match your desktop resolution to be able to enter windowed-fullscreen. The reason for this limitation is simply that the window scaling used by Windows 7 and up makes the game look awful if it has to be stretched. Just a short post to confirm that HAC 2 will be updated to support 1.10 once it’s officially released as a finalised auto-update. The update will be rolled out automatically hopefully just prior to the switch.